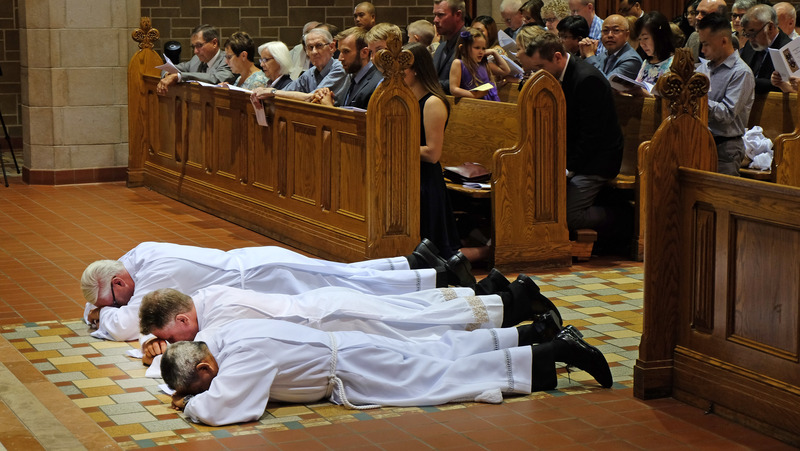 For Elizabeth Morales, the sight of her husband and two other men prostrated before the altar at St. Joseph’s Basilica was the most moving sign of just what it means to be a deacon in the Catholic Church. 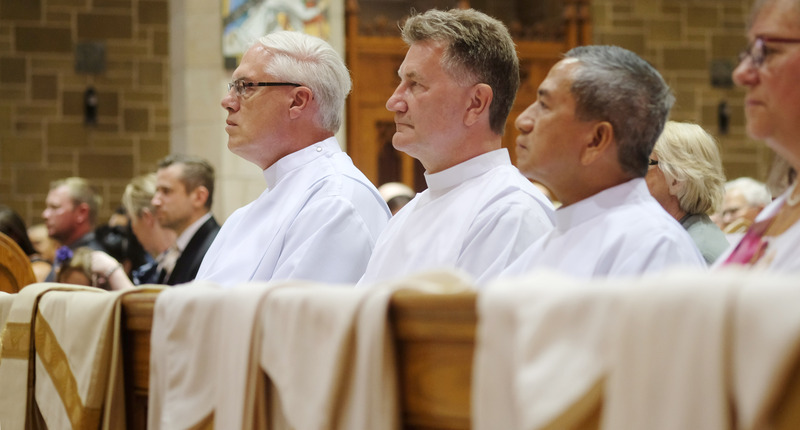 Ramon Morales, Christopher Ashdown, and Edward Meding were ordained to the permanent diaconate by Archbishop Richard Smith at St. Joseph’s Basilica on Aug. 11, in a joyful celebration witnessed by hundreds of relatives, friends, deacons, and fellow parishioners. 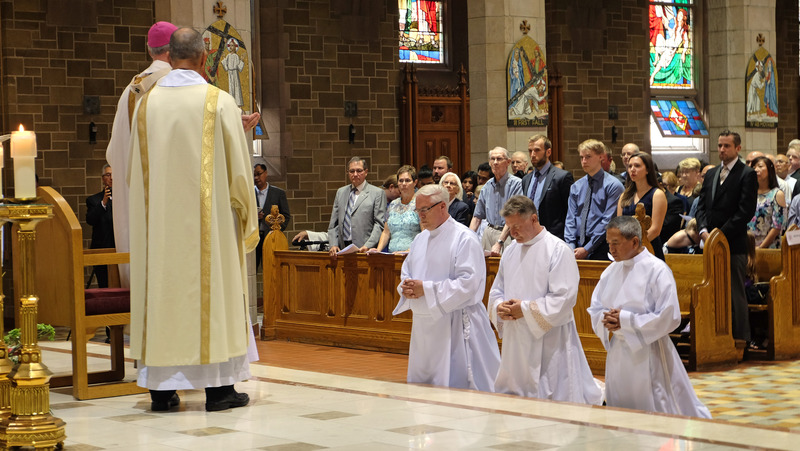 The ordinations bring the total number of permanent deacons in the Archdiocese of Edmonton to 36. 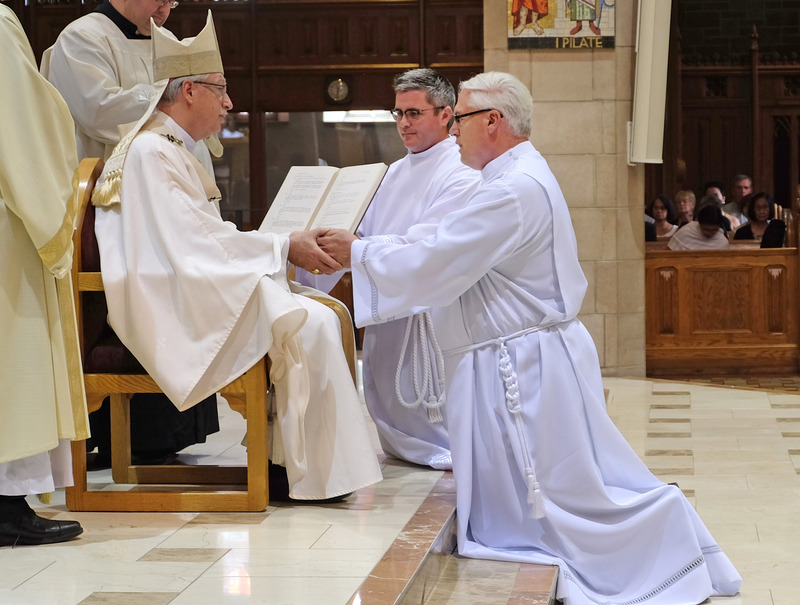 The commitment to service, both at the altar and in ministry to the needy, is central to the vocation of a deacon, Archbishop Smith said. Even the word ‘deacon’ stems from the Greek word for service. 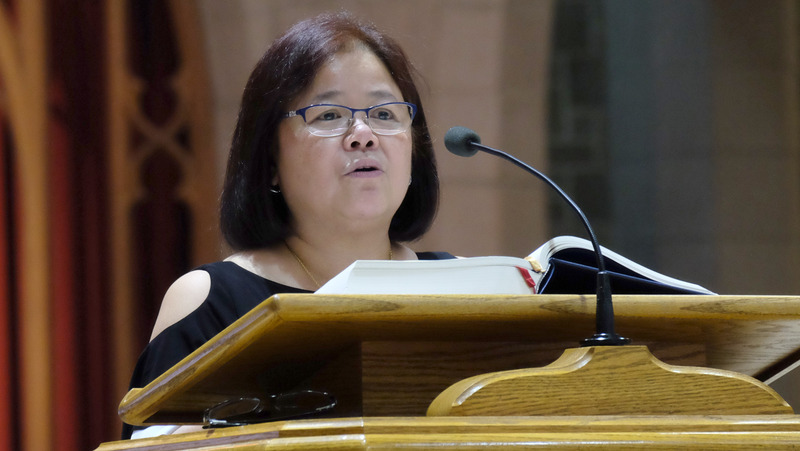 Elizabeth Morales said her husband, a longtime adult server at St. Agnes Parish in south Edmonton, has always been a role model of service for their two sons, and they couldn’t think of a more deserving candidate for the diaconate. 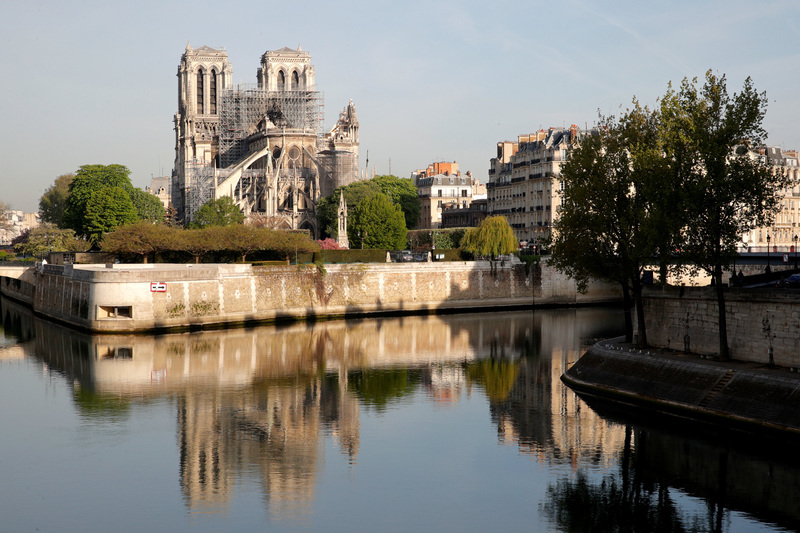 Ramon had always hoped one of his sons might become a priest, she said, but perhaps the prayers were answered through his own ordination instead. 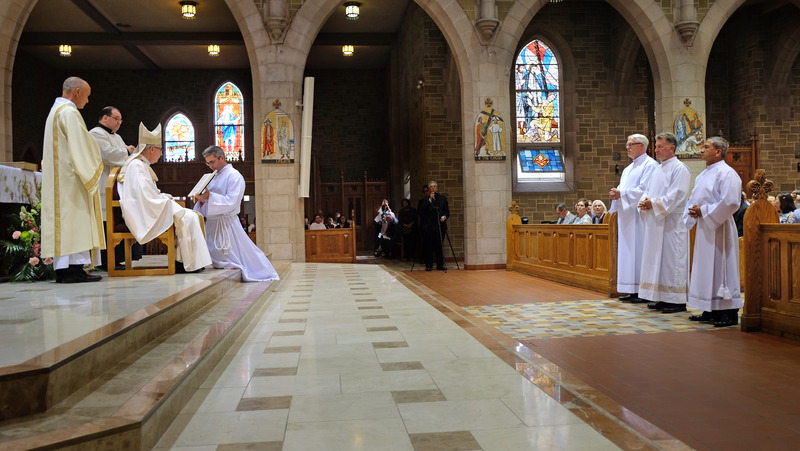 Three candidates listen while awaiting Deacon Lynn Pion calls and presents them to Archbishop Smith for ordination. First Reading was given by Elizabeth Morales, whose husband Ramon Morales was one of the three men to be ordained as deacon. 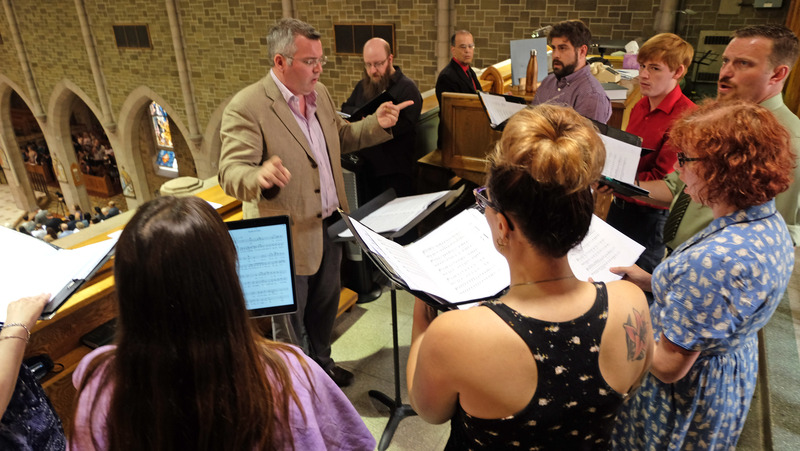 Choir members sang the Gloria and Sanctus from the basilica loft. Gwen Meding offers the Second Reading (Acts 6.1-7a) during the celebration. Candidates are called forward and presented to Archbishop Smith. 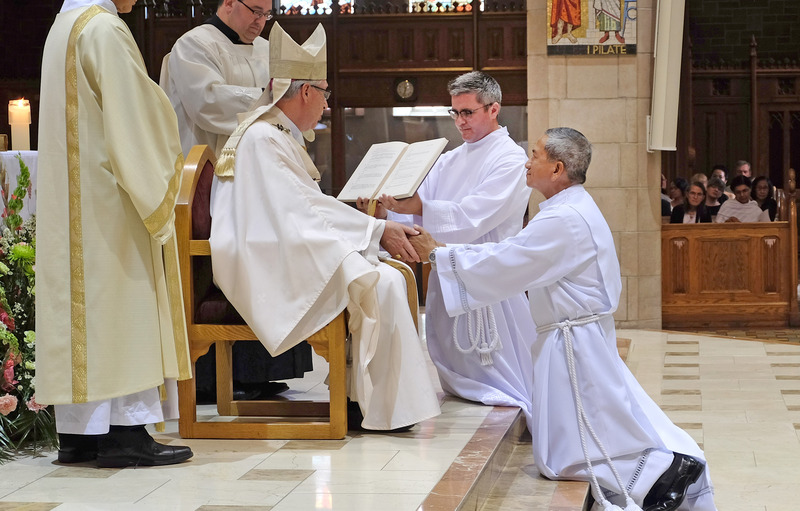 Ramon Morales kneels before Archbishop Smith during his diaconal ordination. 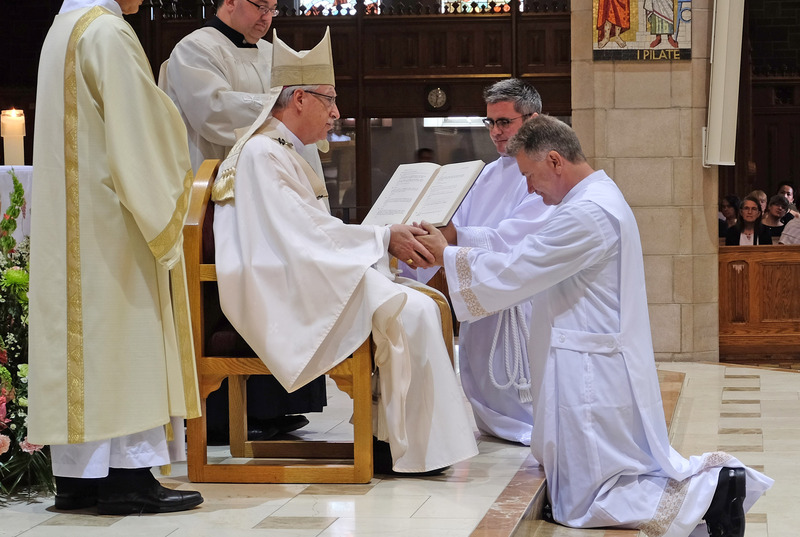 Archbishop Smith lays hands on Chris Ashdown while ordaining him as a new deacon. 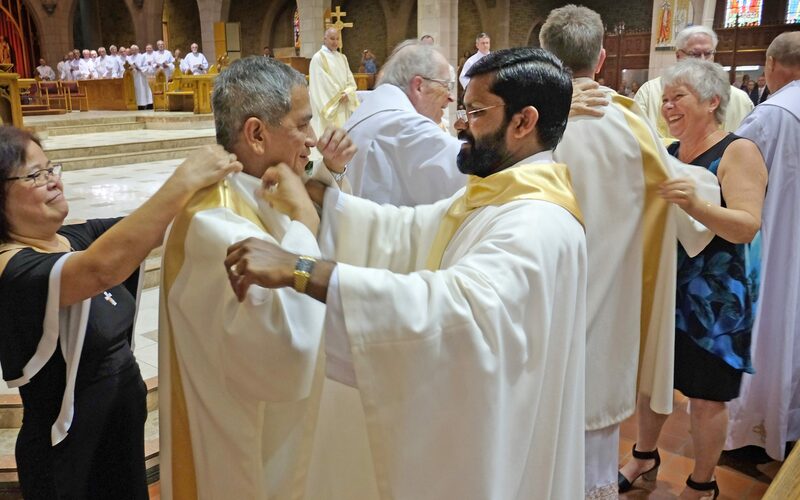 The dalmatic, stole, and alb are vestments presented to deacons upon their investiture. A very happy Archbishop Smith presents the three newly ordained deacons to the congregation. New deacon Chris Ashdown blesses Deacon Lynn Pion following the ordinations. Family, friends and wellwishers were excited to greet and take photos of the new deacons. 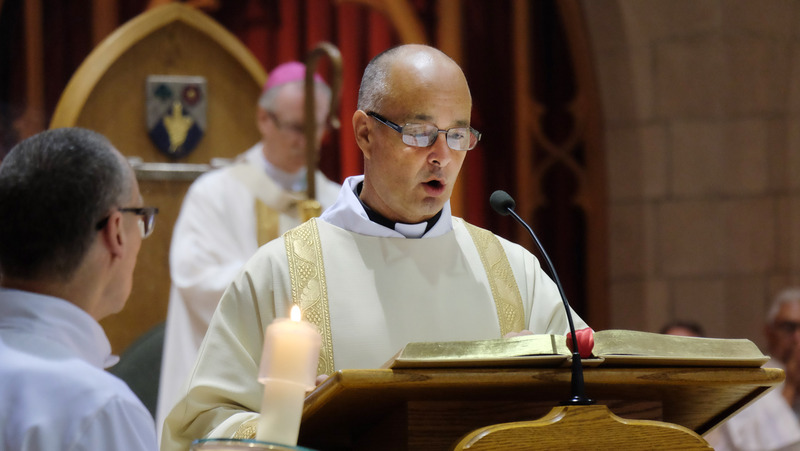 The Archbishop offered special words of recognition and thanks for the wives of the candidates ̶ Elizabeth, Gwen Meding, and Jean Ashdown ̶ as they sat in the front pew. 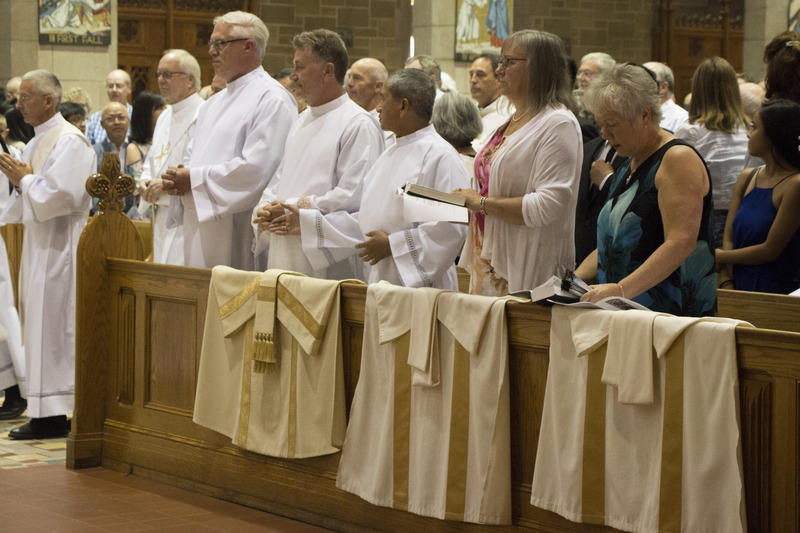 For Gwen Meding, her husband’s ordination was both a day of joy and the start of a new adventure following four years of diaconal formation. “Surrounded by family and friends, that’s been awesome,” she said. “We’ve been on a long journey, with lots of miracles and healings in our lives, so now it’s a new door opening, a new chapter. 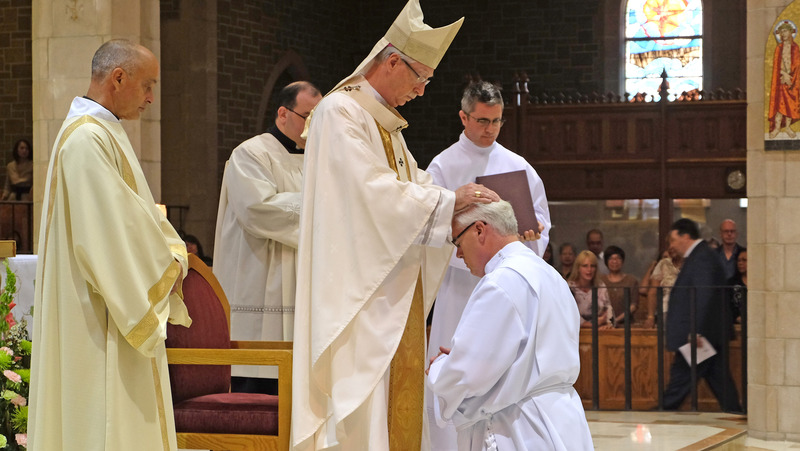 Meding is the first man from Our Lady of the Foothills Parish in Hinton, west of Edmonton, to be ordained a deacon. 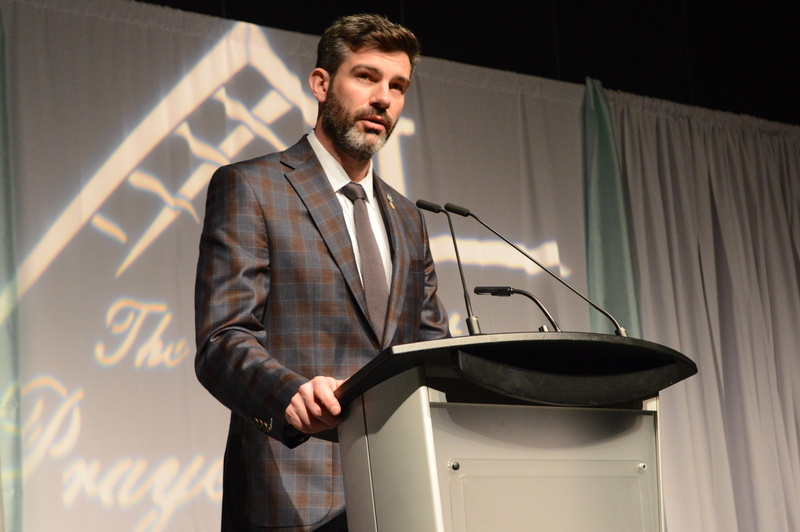 His ministry will take him also to the mission parishes in Jasper, Grande Cache, and Susa Creek, and he will continue to make monthly visits to inmates at the Grande Cache federal prison, something he has been doing for 20 years. The parish has planned an official welcome, including a pancake breakfast, for their new deacon on September 9. Deacon Edward will preach his first homily at the masses that weekend, which will be one of many new experiences for Gwen. The Medings have five grown children, all of whom came to support their dad at his ordination, even though they aren’t personally active in church life. “So for them to come and support him, we’re glad of that, and we’re looking forward to seeing what God is going to do in their lives, coming up,” she said. 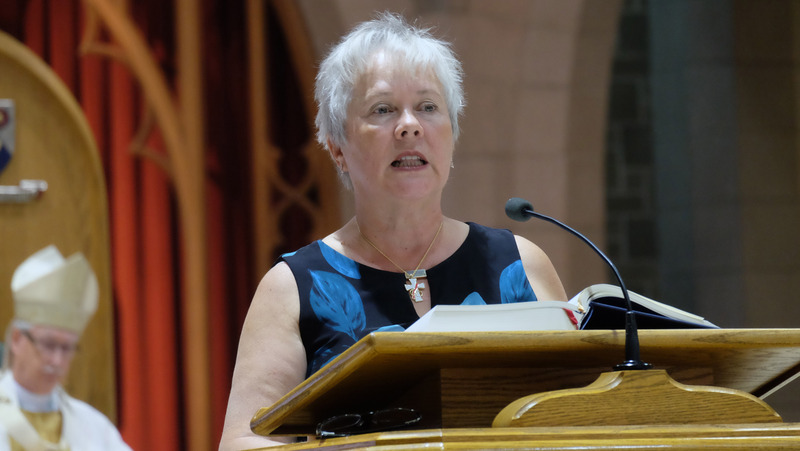 Jean Ashdown described the ceremony as a beautiful celebration with great significance, and like Gwen, she sees ordination as another step in the journey of faith. 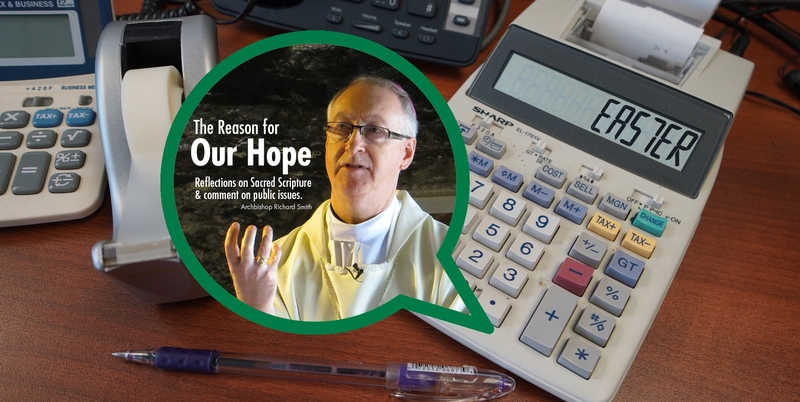 The first time she laid eyes on Chris, he was serving as an adult server at Mass in the chapel of St. Joseph’s College at the University of Alberta, and he has been a longtime server at their parish of St. Thomas More in southwest Edmonton. She’s not sure how it’s going to feel walking alongside a husband who’s wearing a Roman collar. 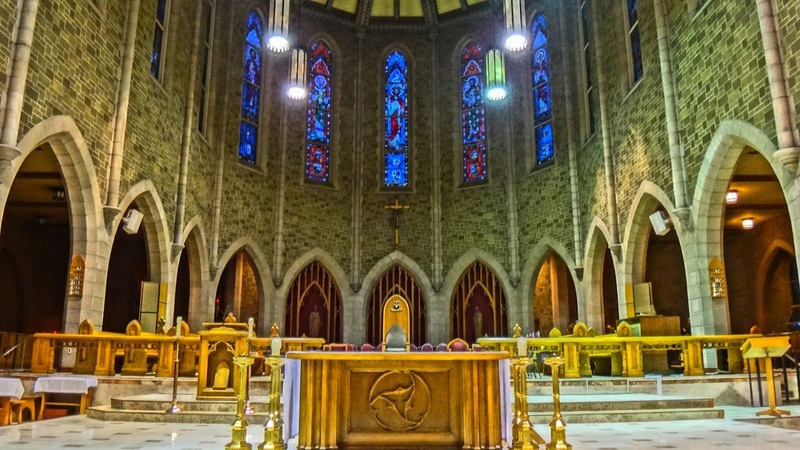 Is there pressure on a deacon’s wife to behave in a certain way? 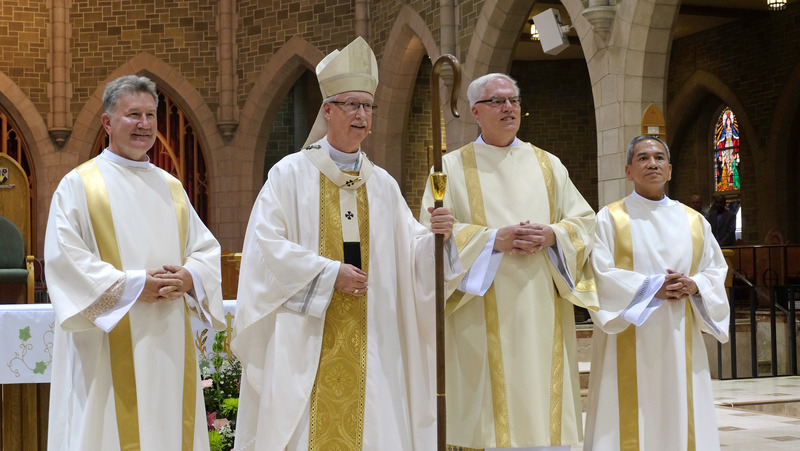 The three new deacons studied in the same cohort as Deacon Gerald Logan, who was ordained for the Archdiocese of Grouard-McLennan on July 7 at St. Joseph Catholic Church in the northwestern Alberta city of Grande Prairie. 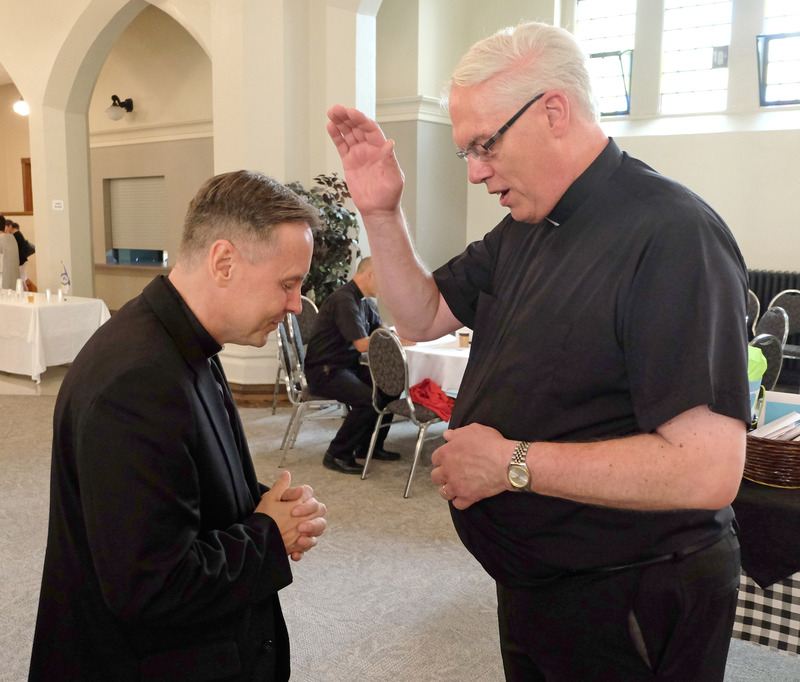 Deacon Gerald proclaimed the Gospel at the Ordination Mass, and joined more than 20 other deacons in warmly embracing their new brothers during the Kiss of Peace. Jean Ashdown has seen a real camaraderie among the deacons that she’s met, an additional blessing of the vocation.